A game by Mega Cat Studios for PC, Mac, Linux, PS4, and Xbox One, not yet released. 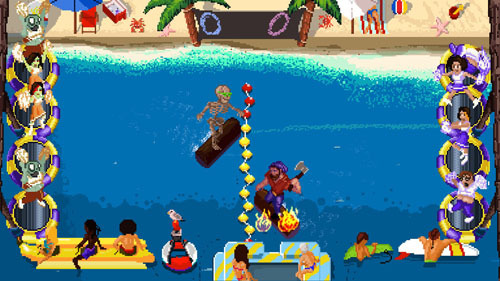 Log Jammers is a modern take on the alternative sports game Windjammers (known in Japan as Flying Power Disc), which appeared in the arcades and Neo Geo in the mid 90’s. The somewhat suggestive title references the fact that opponents face each other on a body of water while logrolling. That is, they run on top of spinning logs. Fortunately, players are not required to employ any tactics to keep from falling off of the log, as the game focuses strictly on the flying disc action… er, flying hatchet action. For the sake of comparison, let’s start with a look at Windjammers. 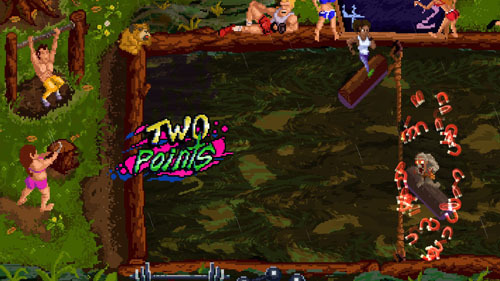 Windjammers features six playable characters with varying stats to indicate their speed and strength, and there are six unique arenas. Games play out in an enclosed arena with a center divider and goals along the left and right sides of the screen. Players can toss their flying disc in a straight line, ricochet it off the walls, or add a bit of English to curve its path. Hitting the goal in the center (yellow section) awards three points, while hitting it on the outside edges (red sections) awards five points, and if the player fails to reach the flying disc before it touches the ground, their opponent is awarded two points. Players must defend their goals, catch and return the flying disc, and be the first to 11 points in order to win the game, or have the highest score when the 30-second timer runs out. Winning a set allows the player to move to the next round and face one of the other computer-controlled characters, or players may face each other in head-to-head games. The game gets more frantic as it goes on, with the disc speeding up as players return volleys, forcing players to dive toward it, and the disc occasionally gets flipped into the air, allowing players to get under it and unleash a powerful special throw. Log Jammers features a selection of eight playable characters, with a great deal more creativity in terms of design. Rather than a bunch of dudes and dudettes with 90’s ‘tude, Log Jammers stars four human characters: a lumberjack zombie slayer, a bad boy surfer (the one guy that actually does have 90’s ‘tude), a track and field runner, and a strongman. The other four characters are nonhuman, with a zombie bear who is the arch nemesis of the lumberjack, a skeleton who is also an 80’s musician, a zombified hobo, and a mayonnaise monster who is running for mayor (yes, a mayo mayor) and who barfs gallons of mayonnaise when he is scored against. Each character has an exaggerated stunned reaction when their goal is breached. Characters each have their own origin stories, most of which center around logging and government corruption. 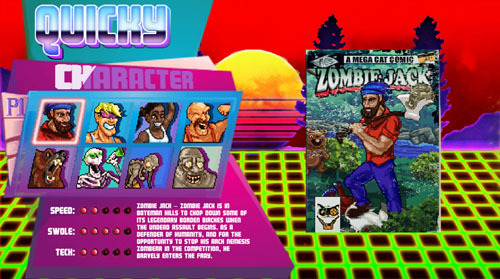 The character selection screen also displays the characters' stats, which are separated into speed, swole, and tech. Gameplay is structured similarly to 1-on-1 fighting games, with players advancing up the ranks and taking on the other seven characters in the roster. Games are won by the first player to score 11 points. 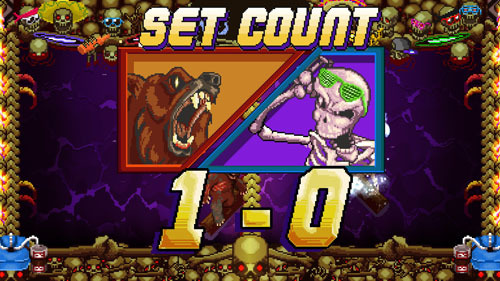 Sets are best of five, and the winner of the round taunts his or her opponent on an interstitial screen, with each character offering a few quips. Completing all seven levels of the tournament reveals a unique ending sequence for each character, similar to those found in 1-on-1 fighting games, and these offer a bit of humor as well. Losing three matches against any opponent returns you to the title screen to begin the game from scratch, with no option for a rematch. 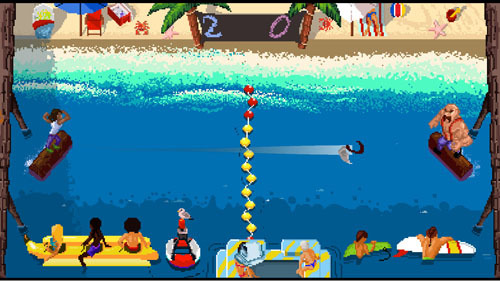 The scoring system is very similar to that of Windjammers, with goals on the left and right sides of the arena that have a yellow center section and red edges. Hitting the yellow section awards two points and hitting the red sections awards five points. 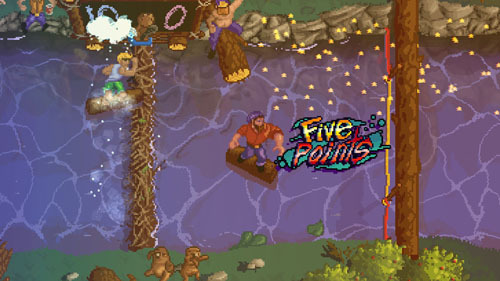 There is no penalty for dropping the hatchet, as the floor of the arena is covered in water, but if the player waits too long to throw the hatchet, it will come out of his hands and fly slowly across the screen, making for an easy catch by his opponent. A bearded fellow rises up out of the water to throw the hatchet to a player, with the first toss being random, and subsequent tosses going to the player who was just scored against. 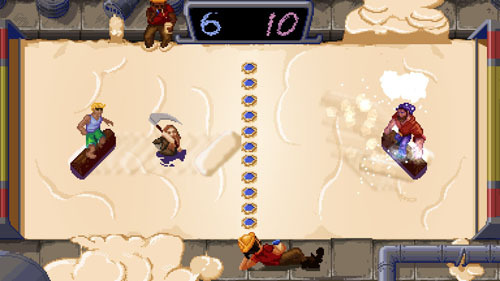 Players may toss the hatchet in a straight line, but much of the game’s strategy centers around banking throws off the walls of the arena to get the hatchet past the opponent. Players may toss the hatchet at an angle by using diagonal controls, or at a sharper angle by pressing UP or DOWN when throwing. Angled throws are less predictable, making it more difficult to line up a 5-point shot on the outside edges of the goal line. The game moves quickly, and CPU-controlled opponents are skilled enough to get shots past skilled players - especially when employing their special throws - so it’s best to seize any scoring opportunity. Powerups are occasionally distributed along the net line, moving slowly up and down. The effects of these powerups aren’t immediately apparent, and since there is no cabinet art or attract screen showing their functions, players are left to experiment until they figure it out. Powerups include a magnet that draws the hatchet toward the affected player, making it almost impossible to get a shot past; a cup of coffee that lets players toss the hatchet so hard that it bounces off the opposing player, essentially granting the powered-up player additional shots on goal until the powerup timer runs out; and a star that lets the player initiate his special throw. Special throws are assigned to a separate button, and players only have a few seconds to use the powerup before it loses its effect, so it’s best to activate it immediately upon taking possession of the hatchet. Special throws are unique to each character, with many of them altering the path of the hatchet in midair, making it less predictable and therefore harder to catch. 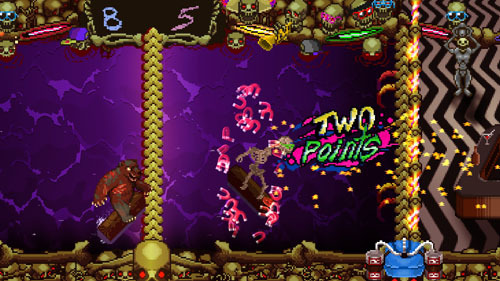 Some powerups result in objects being thrown out that obscure the playfield, such as the 80’s skeleton tossing balloons all over the arena. 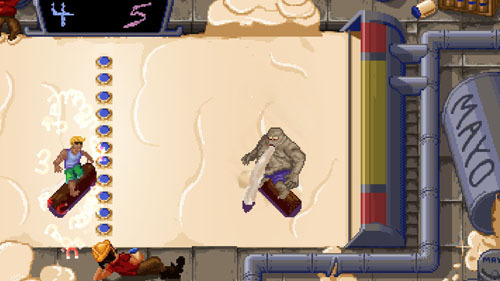 The surfer in particular has a dastardly special throw that allows him to toss the hatchet along the edge of the arena for an easy 5-point score. In addition to the tournament mode, players may take on a “quicky” match that lets them select a jammer and one of the eight arenas, and face off against a random opponent, or players may face each other in online or offline modes. Both the tournament and quicky options offer a cheerleader mode, which plays the same way, but with a row of cheerleaders standing in front of the goal line for an extra layer of defense. Hitting a cheerleader with a hatchet kills her and creates an opening for a future scoring attempt. Gameplay isn’t so technical that players can strategically hit these openings, so in practice, the effect is that individual rounds take longer to finish. 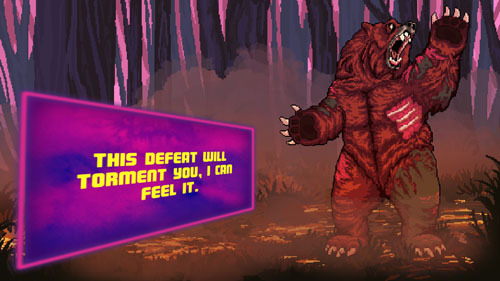 The game captures the retro aesthetic with graphics styled after 90’s-era arcade titles. The game offers a lighthearted feel with over-the-top character designs, silly animations and humorous quips between sets, and lots of personality in the designs of the arenas. Arena locations range from swimming pools and beaches to rivers and a lava-filled hellscape… and even a vat of mayonnaise. Each arena is colorful and lined with spectators that are themed to the area, with a couple of animated characters here and there to add some additional flavor. Mega Cat Studios is known for creating homebrew NES games and releasing them on physical cartridges, along with boxes and manuals, which they have done with Log Jammers as well. 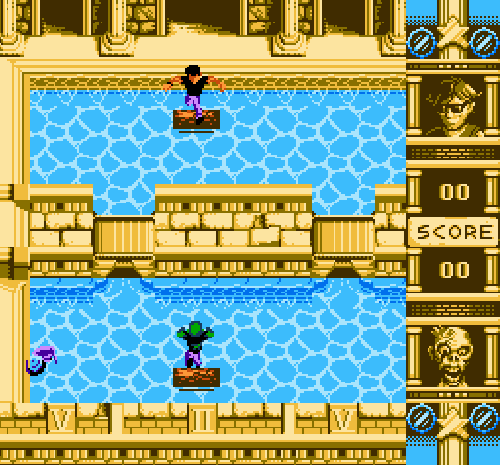 The core concept is the same, but the graphics are at a lower resolution in order to run on the NES hardware, and the arena layouts have changed. Rather than playing the game from left to right in a widescreen presentation, games take place from top to bottom with one player in the back of the arena and one player in the foreground, operating similarly to Nintendo’s Tennis on NES. 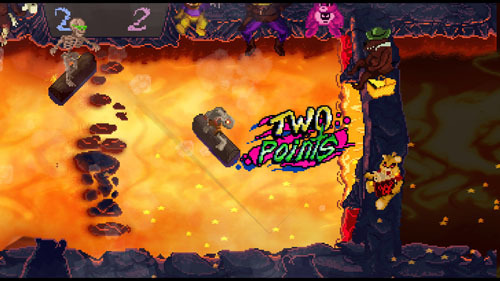 Log Jammers was developed by Mega Cat Studios. The studio previously developed Coffee Crisis and Little Medusa, the latter of which was released physically on NES, SNES, and Genesis.